Vicky Kaushal is winning at the box office and feeling the excitement. After phenomenal 2018 with two Netflix Originals successes and two movie hits, Vicky Kaushal’s first release of 2019 is Uri – The Surgical Strike running successfully on the box office as it has garnered Rs 63.77 cr. Uri is based on the surgical strikes which were carried out by the Indian army in 2016. Besides Vicky Kaushal, the film also features Yami Gautam, Paresh Rawal, Kirti Kulhari and debutante Mohit Raina. To celebrate the success of the film and the love it has been receiving from all quarters, the film’s team came together for a success bash at a restaurant in the city on Wednesday. And in attendance was Vicky Kaushal’s rumoured girlfriend Harleen Sethi. Taking to her Instagram, Harleen Sethi shared a photo from the success party of the film. 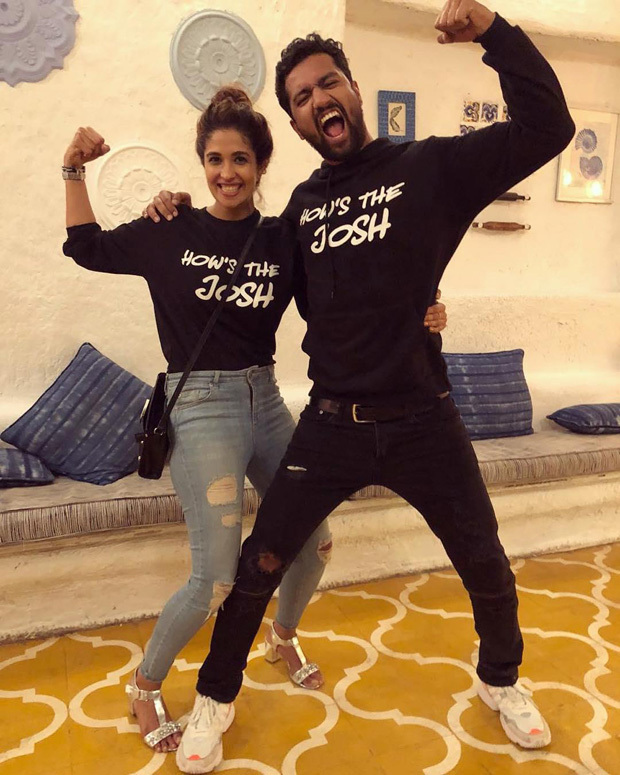 In the photo, the rumoured couple is all smiles as they pose for the camera in the same sweatshirts that read “How’s the Josh?” “High Sir! #URI,” read the caption. Produced by RSVP movies and directed by Aditya Dhar, the film has Vicky Kaushal, Yami Gautam and Paresh Rawal in pivotal roles. Uri- The Surgical Strike has hit the screens on January 11, 2019 and still going strong in the second week.